I ain’t scared of no ghosts. Jerome, AZ is touted as the “Largest Ghost Town in America”, as well as “America’s Most Vertical City”, sitting at more than 5,000 ft above sea level. It started as a copper mining camp and by the 1920s it was home to more than 10,000 people. Jerome’s personality has changed a lot from once a thriving mining camp between the late-1880s and early 1950s, the town is now a bustling tourist magnet and artistic community with a population of about 450. But its external appearances have remained much the same for the last 100 years. My parents and I decided to make a day of it. Jerome is about 100 miles north of Phoenix on state route 89A between Sedona and Prescott. Mom gave me the job of finding a cute place to stop on the way up for brunch. And I think I succeeded supremely. If you are looking for a super good place for breakfast or lunch food then try out Nora Jean’s coffee kitchen in Black Canyon City, AZ. I was extremely jealous of Mom’s patty melt with grilled veggies, Dad had a Reuben with homemade potato salad and I had a breakfast sandwich of egg and bacon on an English muffin. They had fresh, iced, green and peach tea, my newest favorite discovery of cold brew coffee and the lemon bars looked amazeballs. Alright, bellies are full, we are decently caffeinated and ready for our adventure in Jerome. Did I mention it was a ghost town? I have a bit of an obsession with ghosts. I am believer, and a belieber. Hahaha. Ok, seriously. Let’s find some ghosts. First stop was the Jerome State Historic Park. The Historic Park is located in the Douglas Mansion and boasts tons of artifacts and history of the town. Don’t miss the 20 minute video, which takes you through the history and development of Jerome – funny ghost narrator dude too. Speaking of ghosts, when I checked my phone later I had 144 blast photos while I was in the Mansion. This blast photo thing happened on a ghost tour in New Orleans too. Kinda weird, right? The outside of the mansion is gorgeous with lots of mining parts scattered around the area. I thought this model of the town with the mining shafts, faults, etc was pretty cool. Next to the Historic Park is the Audrey Mine Shaft. It is inoperable now but you can go check it out and even stand over the void of the 1,900 ft shaft!! No worries guys, there is a thick plate of glass and a metal crate to keep you from falling in. Thank goodness! The Audrey was the center unit of the main United Verde Extension mine shaft. It was concrete-lined for fire prevention and was state-of-art for its day. The Audrey (I love how they call their mines THE Audrey, THE Edith … can there be THE Kim?) was the main ore hauling shaft. During the prime of its time, it would haul one up to the 1,100 ft level, the ore would then be dumped into a chute cut into the rock where the ore was loaded at the 1,300 ft level into carts which were pulled through a tunnel by an electronically driven engine for transport to the Clemenceau smelter in Cottonwood, AZ. It’s truly fascinating what they did back in the day. Here is the Audrey. And just to give you an idea just how deep 1900 ft is! After the Historic Park where a ghost took over my phone for a bit, and I stood over a 1,900 ft shaft, we moved onto the main drag of Jerome. It isn’t too hard to find, just keep heading up and when you hit all the art galleries, a few restaurants and a few hotels; you are there. Now it’s REALLY time to find some ghosts. First stop is the Jerome Grand Hotel. This hotel on Cleopatra Hill used to be the United Verde Hospital opened in 1927 where sick and injured miners were treated. The hospital closed in 1950 and sat vacant for 46 years. The building had a reputation for being haunted with ghostly sounds of moaning and coughing. Plus a man named Claude Harvey was killed when he was caught under the elevator in 1935. Super scary. At the Jerome Grand Hotel keep a lookout for a bearded man who wanders the halls, a young boy who likes to run around on the third floor, sounds and lights around the elevator thanks to Harvey and supposedly the hotel lobby is a place the spirits like to hang around and play tricks. Alas, we had a drink in the upstairs bar but did not see any strange people or occurrences. Great views from up there though! Next, we parked by all the shops and wandered around. It was Saturday evening and it was Art Night! Sweet, they had free drinks and snacks at every art gallery. And there are plenty of them: lots of great paintings, jewelry and a few oddities. You can stop by Mile High Inn which became home of one of the most famous ladies of the night during the 1900s. She was Madam Jennie Banters (reportedly one of the richest women in northern Arizona) and the inn became her popular bordello; Jennie and her ladies entertained many men during the mining boom in Jerome. She can be seen upstairs usually in the “Lariat and Lace” room. But there is also the phantom cat where guests stoop to pet the cat but then it suddenly vanishes. We stopped by the Mile High Grill (the restaurant below the inn) where I inquired about the cat. I was looked at like I had three heads and then I explained, “you know, the ghost cat”. “Ahhh, haven’t seen it in awhile but if you did it would be upstairs and not here,” she answered. Boo hoo and one isn’t allowed at the inn unless you have a hotel reservation. In between more art galleries – more glasses of champagne and crackers with slices of cheese and pretzels and sometimes a little sandwich and one time shrimp with cocktail sauce; we walked around the tiny downtown and then ran into another of Jerome’s haunted places, the Connor Hotel. Rumor has it, the spirits come and go here. But the rooms are haunted. Room 1 is said to be haunted by a lady in red and her friends. You may hear women whispering and laughing or she possibly comes to see you in your dreams. Scary! In room 5 people say they feel cold spots and the appliances like to go off by themselves. Reminds me of my freshmen year dorm room, my clock could “talk” and one time just went off and told us the time without us pushing the button. THAT dorm was defo haunted! You guys, you must go to this hotel in Menorca. In case you don’t know, Menorca is Mallorca’s little sister. A smaller island just northeast of Mallorca. 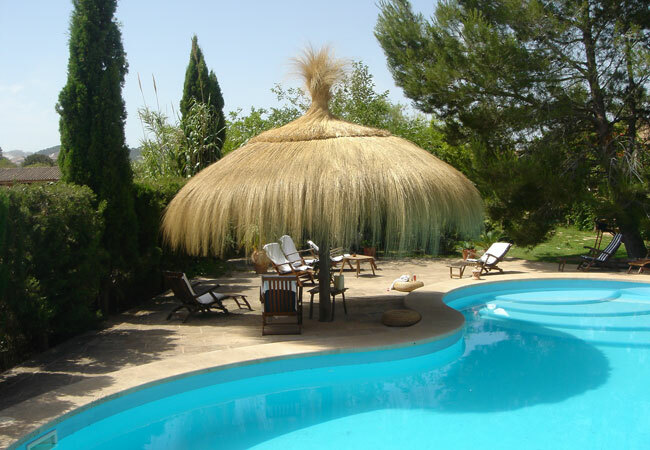 Torralbenc Hotel. SO NICE. Enjoy the chic whitewashed farmhouse buildings surrounded by grass plains and rosemary. It’s so peaceful and was the perfect place for Felix and me to celebrate our 14th (!) anniversary. We took the ferry from Mallorca to Menorca with our car. It was so simple and fun. The 19th-century homestead has been reinvented by Antonio Esteva, who’s usually found designing luxurious private villas. And this one has it all. Modern minimalist rooms and suites have all white everything, parquet floors, balconies, some have private pools, and all the modern conveniences. And get this – breakfast is included, but not just that, you can have it delivered to your room and they set it up on your terrace for you. Seriously, stop. You had me at breakfast delivered to your terrace. And check it out. Yeah, all that can be yours. 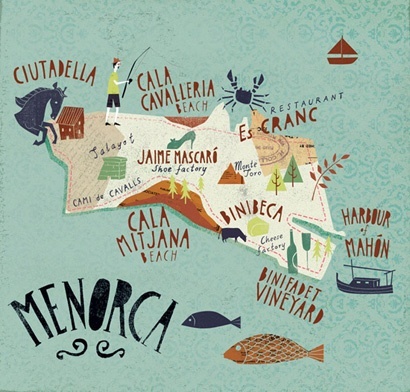 If you want more info about Menorca, you can look at Menorca Part UNO and Menorca Part DOS. A few more pictures of the place. Go and enjoy it as soon as you can. I know I will be back soon too. See you there! For some reason time has really, REALLY gotten away from me. I went to Marrakech, Morocco last year and I have been wanting to write about my experiences but … time. You know. So, here we are! Let’s talk about Marrakech/Marrakesh. However you are wanting to write it or pronounce it for that matter. My next few posts will be dedicated to my travels there. I would like my first post to be about the fantastic and gorgeous riad that Perla 🙂 and I stayed at during our trip. 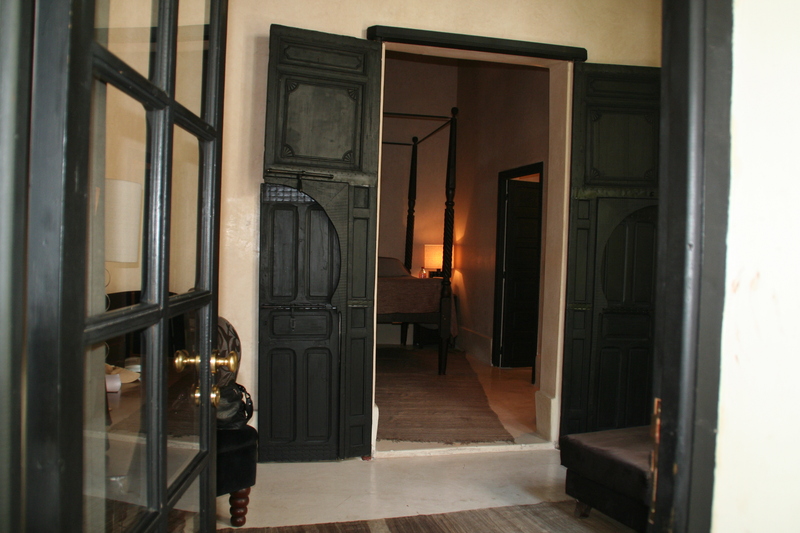 A riad is a traditional Moroccan house or palace with an interior garden or courtyard. The word riad comes from the Arabian term for garden, “ryad”. The ancient Roman city of Volubilis provides a reference for the beginnings of riad architecture during the rule of the Idrisid Dynasty. Our riad was Riad Dar Darma and it was so lovely. From the staff, to our room, the hospitality, the exquisiteness of the place – it became our home away from home. This was my first time in Morocco and I chose Marrakech because I had heard so many wonderful things about it. While I enjoyed it, it could often be a bit overwhelming in many situations. These I will speak to in my next blog. But Dar Darma was always a place we could come back to and relax. There were no worries here, everything was beautiful and calm. If we had questions, they would help us with the answer. If we wanted a book a reservation, they did it – and beyond! We stayed in the Black Patio suite. 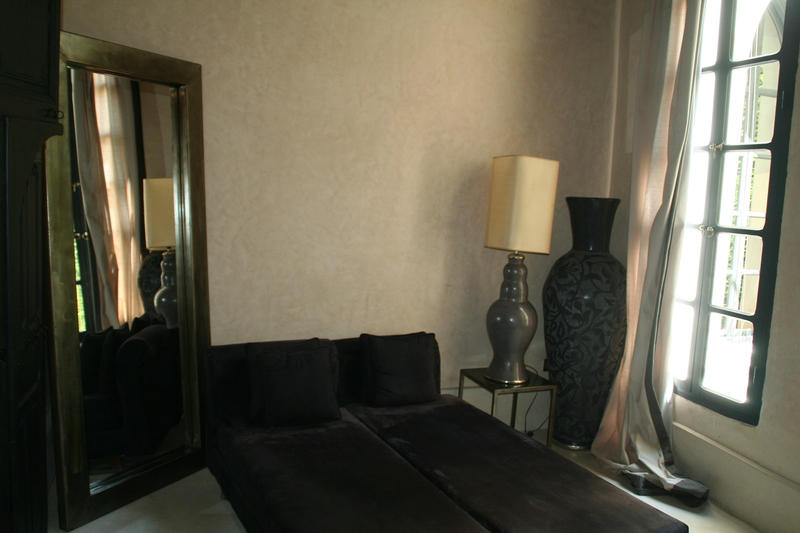 It was three rooms – a sitting area with two chaise lounge chairs, a large mirror and a TV (which I don’t think we turned on even once), a bedroom was two poster beds that could be separated, a large armoire and two nightstands and a bathroom with a large marble tub and two sinks. This room overlooked a shady patio. For me, it was perfect. Here are a few pics from the room. I’m not sure my pictures do it justice but the room was just what I was wanting. And the staff was over-the-top helpful. Pretty much, whatever you want or need help with, they will do it. Perls and I weren’t too demanding, pretty much a bottle of wine and that was it. And you know at most hotels you have set breakfast hours, which I understand but how nice was it to hear “When you get up, come upstairs to the terrace for breakfast.” And I said, what if we get up at 11? Then come upstairs then. And at 12, I asked. Then come upstairs then! I could have kissed them. I get to sleep until I want and still get my breakfast! And breakfast was delicious. 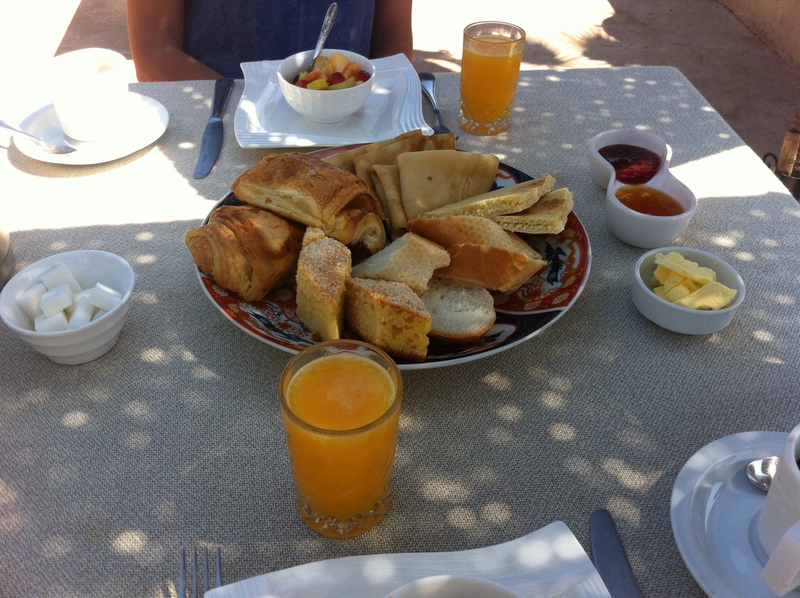 Fresh fruit, fresh orange juice, a hot pot of coffee and fresh breads, crepes with jam and butter. Heaven! 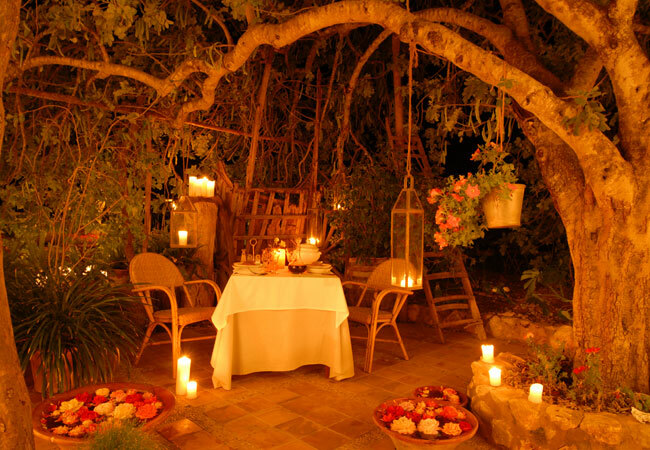 We never had dinner at the riad but next time I will make sure I do. Their meals are all made using fresh ingredients and traditional Moroccan and international recipes.The classic dishes include: harira soup, meat or vegetable tajines, couscous, lemon chicken, freshly baked cakes, and fruit desserts. They also have cooking classes with their cook Maria who can let you into the secrets of Moroccan recipes. The terraces are so relaxing with lots of pillows and breathtaking views of the Koutoubia Mosque and the Atlas Mountains. They also have a hammam for you to use at your leisure. 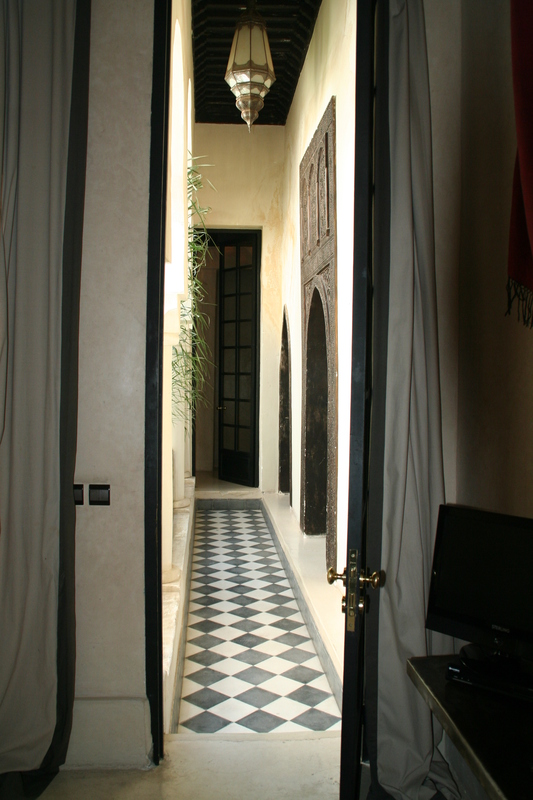 The Dar Darma was a place that I truly needed for this first time experience in Marrakech. With a new and different and sometimes frustrating world that was the streets of Marrakech, Dar Darma was a comforting place to come back to. I so appreciated the happy faces and the courtesy and helpfulness I received there. I will definitely be back one day. Thank you Dar Darma! MWUAH. Hola! How are you today friends? My cousin, Megan and I, went to Menorca last weekend. Where is Menorca you may ask? Well, let’s consider Mallorca the island major and menorca the island minor. It is only a hop skip and a jump away from here. 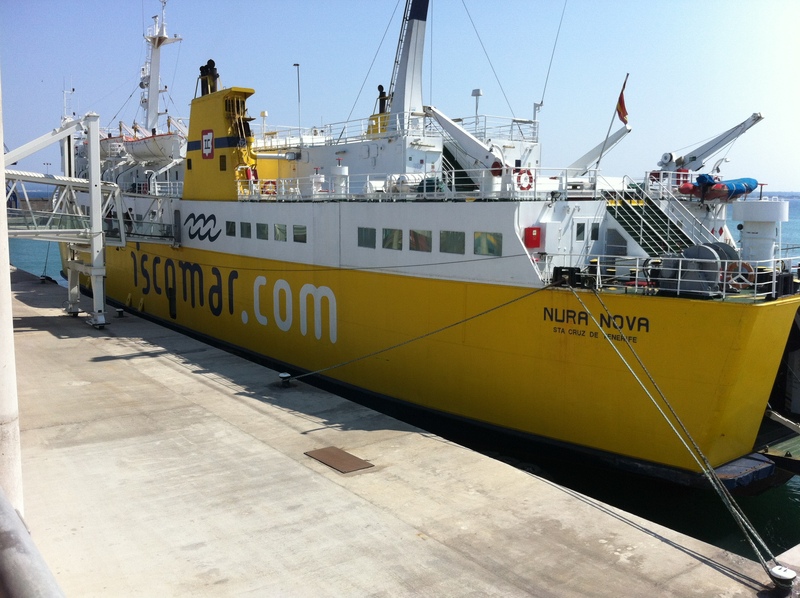 There are two ferries you can catch from Alcudia (in Mallorca) to Ciutadella (in Menorca) – Balearia and Iscomar. Balearia has a faster boat which only takes 1.5 hours between each island and Iscomar boats take about 2.5 hours. Of course the faster boat is a bit more expensive but each way is anywhere between 45 – 80 euros depending on what all you want regarding speed and schedule. Don’t you just love this little sketch I found? It is adorable! I wish we would have had more time to have seen everything. Menorca is MUCH smaller than Mallorca and I was surprised at how quickly we could get from one end of the island to the other. Let me tell you about the trip. I decided that we would take our chances with the ferry ticket and we would purchase the round-trip ticket when we arrived in Alcudia on Friday. Why? I don’t know. Stupidity, probably. We arrived about an hour and a half before the Iscomar ferry was scheduled to leave, I asked for round-trip tickets, Friday and return on the Sunday 7:00 p.m. ferry. “Sorry, the 7:00 ferry is booked. We have the Monday ferry available?” Ahhhh, why do I do these things?!? I smiled at my cousin who may or may not have been panicking inside. We both had to work early Monday in Mallorca so that was not an option. “Two one way tickets to Menorca please.” I responded. And we got on the boat! It was a very nice boat! We sat on the top deck in the sunshine and drank a beer while we cruised to Menorca. 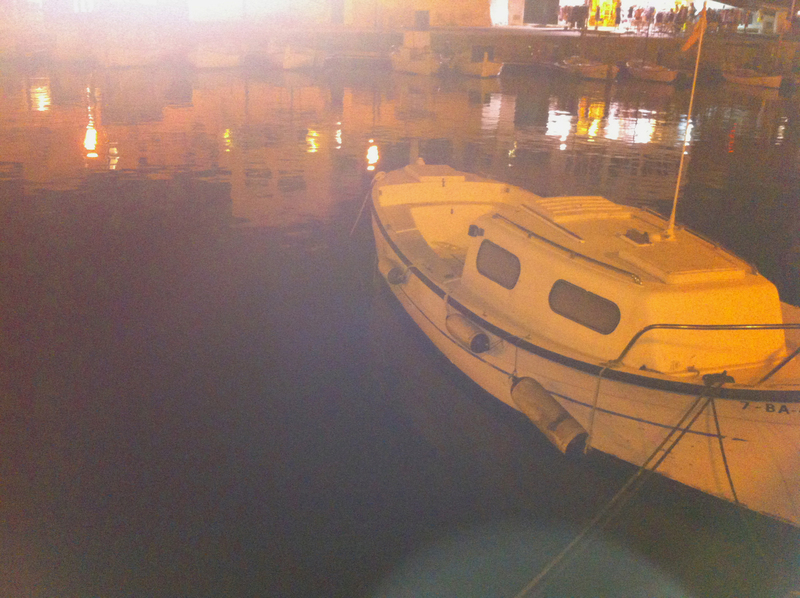 We arrived at the Ciutadella port a little after 19.30, jumped in a cab and went to our hotel, the Prinsotel. It was a nice hotel for a great price. The room was clean, a big pool, friendly staff and just a tad bit on the outskirts of Citutadella (about an 8 euro cab fare to the centre). We cleaned up, got ready for dinner, easily booked the 11 pm ferry back with Balearia on Sunday evening and we were off to have some food. Ciutadella had a really fun and vibrant atmosphere going on. We headed down to the port where there is pretty much fish restaurant after fish restaurant with the same menu, maybe a pizzeria or two thrown into the mix. We choose a fish restaurant (naturally) with tables right at the edge of the port and settled in. It was lovely! There were fish jumping out of the water! Here is a picture from where I was sitting. Gorgeous, right? After dinner we headed towards the “bar/nightclub” area around the Pla de Sant Joan. We thought JAZZBAH looked the best and it was so fun it was the only one we ventured to that night. There are three levels: the bottom level is the dance floor, the next two levels are more of a chillout area with tables that overlook the other clubs surrounding the area and the port. I ordered a POMADE, which is gin and lemonade but it was more like a lemonade slushy and it was absolutely scrumptious. I had a few more …… PARTEEEE TIME! The next morning we ventured out of our hotel and grabbed a taxi to AVIS for our car rental. I will try to make a long story short BUT when we arrived and said we had a reservation they asked for our International Driving License. Okay, yes, I read in all the books that you should have one but NEVER in my 7+ years of living in Europe have I ever been asked for one – this is including being pulled over my Spanish Policia plenty of times. I argued and stated what I just told you but they stood their ground. So, last time I reserve a car with Avis in Europe. I had them call us a taxi and funnily enough it was the same taxi guy that dropped us off! He asked, “Que pasa?” and I explained the situation back to him in Spanish. WhoHoo for ME! He took us to Europcar and we had no problem renting a car with them. So off we went. 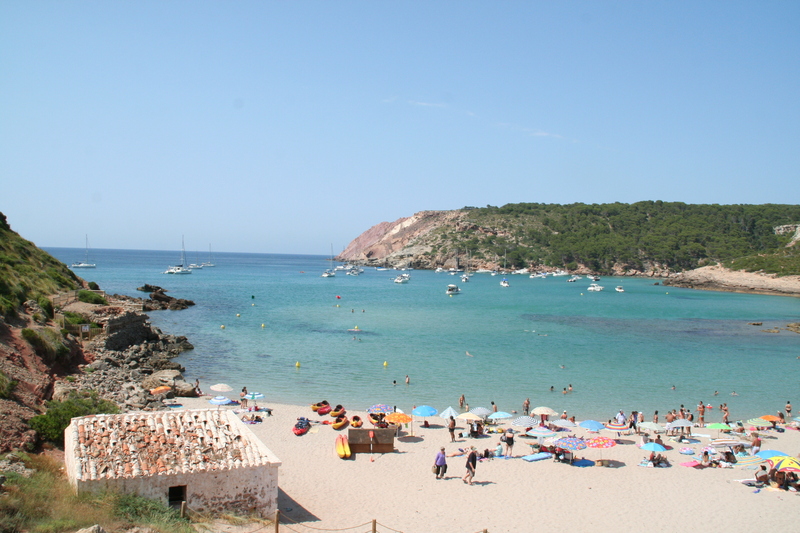 To a gorgeous beach on the Northern coast – Cala d’Algariens. If you go, don’t park in the first parking area keeping driving down that bumpy dirt road, there is a parking area much closer to the beach. We arrived, walked about 10 minutes until we got to the beach, walked down the wooden steps and crashed. We were tired, possibly a bit hungover (those Pomades!) and it was freaking hot. But check out the view. The water was cold! And it gets deep pretty fast. But it was an expansive beach with room for everyone. Come and visit! After a couple of hours chillaxing we figured we should drive to the other end of Menorca and check-in to our hotel, shower up and grab some food. We opted for a quiet night in Mahon from partying it up the night before. We finally checked into the Catalonia Mirador des Port. I say finally because they are many one way streets and it was difficult for us to find the correct street that would actually take us there! Possibly you could chalk that up to be hungover… Anyways, I was extremely disappointed in the hotel. While the reception woman was very nice and breakfast (for an extra 8 euros each) was fine, the room reeked of cigarette smoke and everything was out-dated. Regardless, we unpacked and walked around the Mahon port area. It was much quieter than Ciutadella. But sweet and tranquilo. We stopped by the restaurant Casanova (Moll de Ponent 15) for a huge personal wood-fired oven pizza. Delicious! Just what I was needing. We had big plans for the next day – the horse festival in Es Mercadal (my favorite festival so far! ), a cool bar on the cliffs of Cala En Porter and a beach on the Southern coast. Check back soon for Menorca Part Dos! Gracias! NOLA – New Orleans, Louisiana. Ah-May-Zing! So much fun. And I feel silly for saying this, but it was my first time there. I really don’t know what took me so long. I guess it was just the distance from my older stomping grounds. In Oklahoma we would head towards Lake Texoma, Padre or once for a college spring break we drove from Stillwater to Fort Lauderdale. When I lived in Dallas, well, I went to, um, Dallas! And when I was in the New York/CT area I went to well, Manhattan, of course. But also to Mt. Snow, Vermont and a few other random Pepsi sponsored ski areas. But I am getting off track. Jeannette (the lovely) and I went to the Big Easy for our 40th celebration. We met up at the Maison Dupuy hotel. A very nice hotel with possibly a dead, bald guy in the hot tub. He NEVER left y’all! The rooms were clean, the shower had nice water pressure (something that is very important to me), the front staff were nice and friendly, there was a pool and free Wi-Fi. All in all, a great hotel for a decent price. As I just said, I had never been to NOLA, even though Jeannette was a seasoned pro. We headed down Bourbon St. to see the crazies and get a drink. I was bound and determined to have a Hurricane but then thought, do I really want to throw up on my first day here? 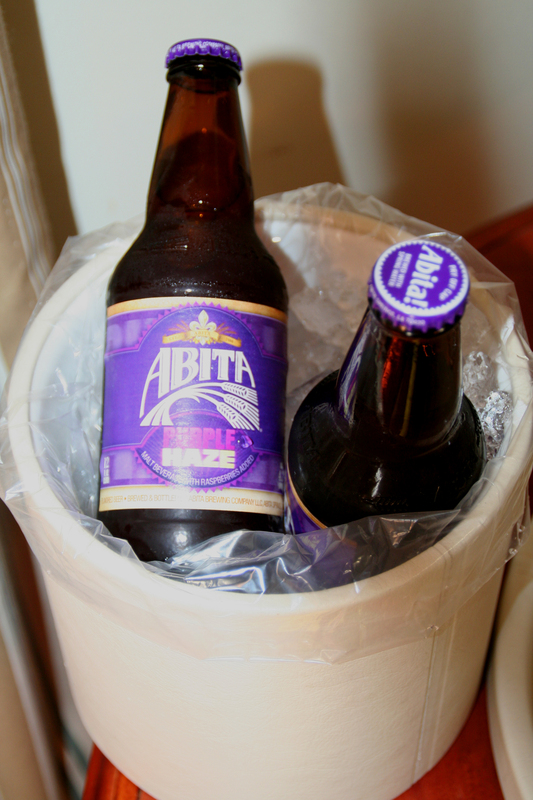 I settled for a beer and Jeannie introduced me to my new favorite beer – ABITA Purple Haze. Abita beer whether it was Purple Haze or Amber was a constant for the remainder of our trip. 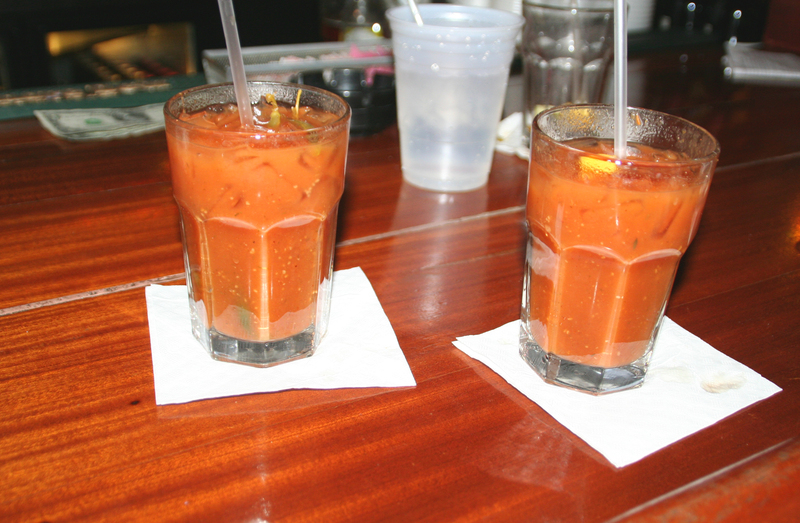 Well, that and Bloody Marys, mmmmmmmmmmmmm, don’t EVEN get me started on the bloodies from Molly’s at the Market. We watched them being made: a little Guinness, half a squeezed lemon and lime, some Cajun seasoning, worchestire, horseradish, tabasco, juice from the pickled green beans (i wish i could have brought back 12,000 jars of those) and their already mixed bloody mix. The first time there we had THREE. I would have had more to stare at that mellow cat that hangs out on the tables with the customers but my stomach was rumbling and we needed to get ready for dinner. Speaking of dinner/food we ate SO GOOD. Here were our stops and each were amazing. And in all actuality, it was mainly about the food. Don’t miss any of these. 1. Dante’s Kitchen – Ok, this place…they have the best vegetables in any New Orleans restaurant, an outdoor patio, and an amazing wine list. They have incredible meat and fish dishes too. This is a great restaurant to get away from downtown, and one of the most inspired menus I’ve seen anywhere. The food and produce is fresh, fresh, fresh, and they accentuate the freshness with the preparation and presentation. The only thing I will say is that the portions are HUGE!!! Bring some friends and plan on having one of the best meals of your life. 2. NOLA – This is one of Emeril’s restaurants in New Orleans. Featuring an eclectic menu of New Orleans Creole and Acadian cuisine with an occasional ethnic twist, the rustic style of cooking showcases Southern Cajun, Vietnamese and Southwestern influences using Louisiana products. Private dining rooms, a bread and pastry bakery and wine cellar are located on NOLA’s third floor. 4. Felix’s Oyster Bar – Besides being the name of my favorite boyfriend, it was also a fantastic place to grab a seat, an Abita and a dozen oysters. They also have Po-boys, seafood platters and some darn good fried pickles. Man, I could really go for another dozen oysters with lots of horseradish and lemon. 5. Central Grocery – Central Grocery is home of the muffuletta, one of New Orleans’ great sandwiches. A circular loaf of soft Italian bread is sliced horizontally and piled with salami, ham, and provolone, which are in turn topped with a wickedly spicy melange of chopped green and black olives fragrant with anchovies and garlic. You miss this, and you might cry. 6. Café Du Monde – World famous for its cafe‘ au lait, beignets, and the opportunity to people watch. Another New Orleans favorite, stop by for a chicory coffee and beignets to cure your morning hangover. The service was a bit slow while seated so maybe check out the TO GO line on the side if you are in a hurry. But it is a don’t miss. 7. Satsuma Cafe – Their Kale Salad, made of all local ingredients, fresh, and organic, features Lacinato kale, Parmesan dressing, and (this is New Orleans after all) a piece of bacon on the side. This is the BEST SALAD in the city, hands down. A few blocks away from Desire Street, (which kind of says it all), and in the stunning Baywater, this is the hippyish place to go for great coffee and espresso, fresh ginger muffins, super great Nutella banana pancakes, fresh BLT’s with real tomatoes, hummus, bagels and lox with all the sides, and fresh juices made to order. It’s also all organic. Sit at the Squirrel Table and read the New York Times, or a local paper with the locals (and believe me, they’re there). 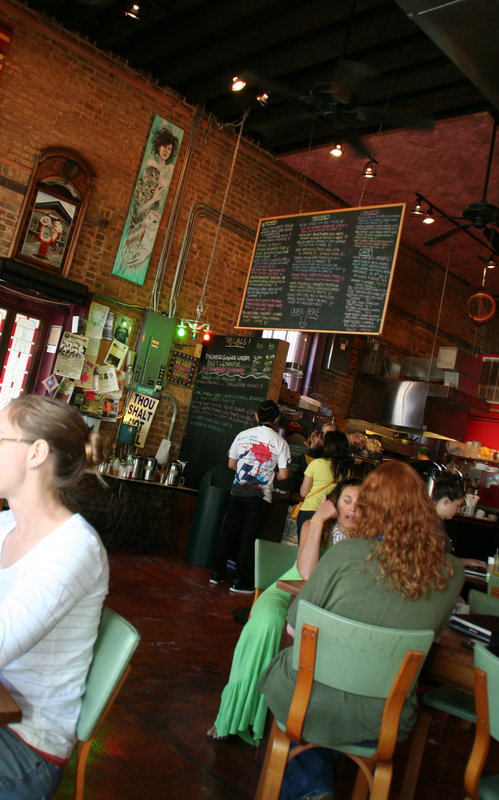 It has a totally great vibe and fresh, fresh, fresh organic food. These guys make an effort and it shows. I think I will take a break here. Now I am craving an oyster po-boy, an Abita Purple Haze and some excellent fried chicken. Stay tuned for some more New Orleans news and lots of cool pics. Ciao! Before Felix and I moved to Mallorca we had already visited the island several times. And except for our very first trip here (awwww – we had JUST met) on the very first night we always stayed at Son Mercadal. We affectionately call it The Farm. I still love it, and I miss staying there. 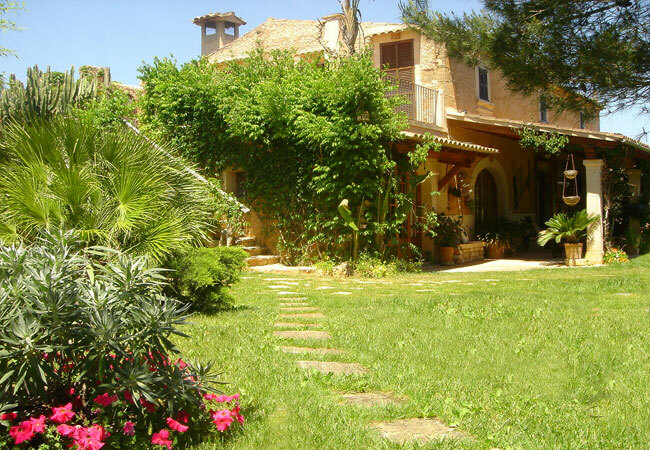 It is a rustic finca (which is basically translated into a farm, but can also be a large country estate to a small rural property). However you want to define it, a finca is always in the country and I have never seen one that I don’t love. But Son Mercadal has a lovely charm about it. It is a family run hotel and every single room has its own special characteristic about it. Whether you have one of the upstairs rooms with its own private balcony or one of the room downstairs where you have your own private door to go outside, it is a fantastic place to get away from it all. The pool has lovely oak trees surrounding it and a walk in the gardens can make you feel a million miles away from everything. Don’t forget to say hi to the donkey and if you want to ride a horse or a bicycle – guess what, you can! Isn’t this place amazing?! And when you think you are completely in heaven you get to eat! And I love to eat. Breakfast (usually coffee or tea with toast or ensaimada) on the terrace is included in your room rate (which is super inexpensive btw) and if you have dinner there in the restaurant, you won’t be disappointed. I remember a mouth-watering feast of a mallorquin stew followed by suckling pig all washed down with local mallorquin wine. What are you waiting for? 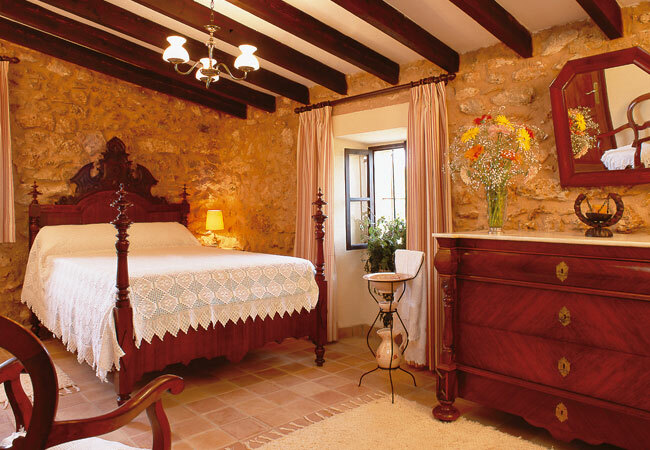 Book a stay at Son Mercadal. I promise you won’t be disappointed.